This wampum belt, which is on exhibit at the Philadelphia History Museum, was said to be given to William Penn by the Lenape tribe at the time of the 1682 treaty. The belt, donated in 1857 to the Historical Society of Pennsylvania by a great-grandson of Penn, is made of white wampum with darker accent beads and depicts two figures holding hands, often interpreted as a sign of friendship and peace. Wampum refers to the shell beads used as currency by Native Americans in the eastern United States. The beads are made of clam and whelk shells and were used as memory aids, often given to commemorate important events such as engagements, marriages, or funerals. Wampum could be fashioned into a belt and used to keep an oral history. The belts were also used as currency and — as seems to be the case here — to mark the creation of treaties. Penn Treaty Park, named for the traditional story of William Penn’s peaceful treaty with the Lenni Lenape Indians, is found at 1341 N. Delaware Avenue in Philadelphia’s Fishtown section, about 1½ miles upriver from Penn’s Landing on the Delaware River. The treaty supposedly was agreed to on land now occupied by the park. 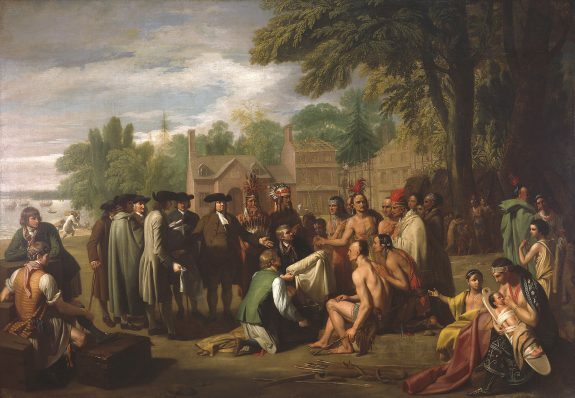 In Penn’s Treaty with the Indians, by Benjamin West (1738-1820), the iconic event is depicted as West imagined it. The site of the agreement was said to be marked by the Great Elm, located to the right in the image. The original elm fell during a storm in 1810, and two hundred years later, in May 2010, a descendent elm was planted in its place. Though no first-hand evidence of the treaty exists, West and other artists have contributed to the legend through their art, and the park’s establishment helped perpetuate it as well. 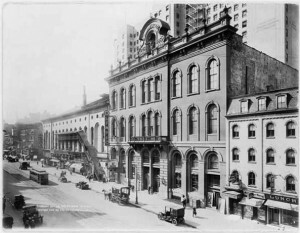 Tammany Hall in New York City is the central building in this image. According to historical legend, the leader of the Lenni Lenape tribe with whom William Penn made his treaty was named Tamanend, who is quoted as saying the English and Lenni Lenape would “live in peace as long as the waters run in the rivers and creeks and as long as the stars and moon endure.” After his death at the turn of the eighteenth century, Tamanend became a hero figure. Colonists who wished to create a uniquely American identity for themselves chose to deify the Native American, calling him “King Tammany” and “The Patron Saint of America.” Tammany Societies sprung up throughout the colonies in the early eighteenth century, and many threw Tammany Festivals to celebrate and honor Tamanend’s memory. 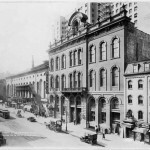 Some Tammany societies endured, and this 1914 photograph shows the infamous Tammany Hall in Manhattan. After having a variety of meeting places, or “wigwams,” the New York Tammany Society built this structure in 1867. This building was the headquarters for the organization that became synonymous with political corruption and the Democratic Party’s political machine. 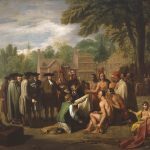 The Treaty of Shackamaxon, otherwise known as William Penn’s Treaty with the Indians or “Great Treaty,” is Pennsylvania’s most longstanding historical tradition, a counterpart to the foundation stories of Virginia (John Smith and Pocahontas) and New England (the first Thanksgiving). According to the tradition, soon after William Penn (1644-1718) arrived in Pennsylvania in late October 1682, he met with Lenni Lenape Indians in the riverside town of Shackamaxon (present-day Fishtown). There, beneath a majestic elm, they exchanged promises of perpetual friendship. The tradition may well have a historical basis in an actual treaty meeting in Shackamaxon; however, as the term “tradition” indicates, the event is not recorded in original primary source documents, and its details and very occurrence have been debated. The treaty’s renown was amplified through literature and art. The French philosopher Voltaire (1694-1778) famously declared it “the only treaty between those people [the Indians] and the Christians that was not ratified by an oath, and was never infring’d.” (Quaker doctrine prohibited Penn from making oaths.) The painter Benjamin West (1738-1820), commissioned by Penn’s son Thomas (1702-75), created the ubiquitous emblem of colonial Pennsylvania and American Quakerism in William Penn’s Treaty with the Indians When He Founded the Province of Pennsylvania in North America (1771-72). West’s tableau (now at the Pennsylvania Academy of Fine Arts) informed early historical accounts of the treaty. It was adapted, and further popularized, in the Quaker folk artist Edward Hicks’s (1780-1845) Penn’s Treaty and Peaceable Kingdom paintings. To this day it illustrates history textbooks. In eighteenth-century diplomatic records, Native Americans frequently invoke their original relations with William Penn. These references, however, are more consistent with the general idea of a treaty than the specifics of the Treaty tradition. 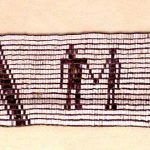 In 1857, Granville John Penn donated to the Historical Society of Pennsylvania a belt of wampum (shell beads) depicting two men joining hands; the Lenapes had purportedly presented it to his great grandfather at the Treaty (it is now at the Philadelphia History Museum). Considered Philadelphia’s first public monument, the obelisk has since been joined by other memorials in what is now Penn Treaty Park (1341 N. Delaware Avenue, in Fishtown). Some academic commentators, especially critics of West’s painting, argue that the tradition was invented to idealize Pennsylvania’s past. Others suggest that it combines the memories of many documented treaties and land purchases, or that it aggrandizes a single such meeting into a Great Treaty. One possible basis is a treaty in June 1683 that resulted in several land deeds signed by Penn and the Lenape leader Tamanend (the legendary “Tammany”), among others. The location is unspecified, but it may have been Shackamaxon. Formal promises of friendship were likely exchanged, perhaps under the Great Elm. There is no evidence to the contrary. Du Ponceau, Peter Stephen, and Joshua Francis Fisher. A Memoir on the History of the Celebrated Treaty Made by William Penn with the Indians: Under the Elm Tree at Shackamaxon, in the Year 1682. Philadelphia: Printed for M’Carty & Davis, 1836. Jennings, Francis. “Brother Miquon: Good Lord!” In The World of William Penn, edited by Richard S. Dunn and Mary Maples Dunn, 195–214. Philadelphia: University of Pennsylvania Press, 1986. Milano, Kenneth W. The History of Penn Treaty Park. Charleston, S.C.: The History Press, 2009. Newman, Andrew. On Records: Delaware Indians, Colonists, and the Media of History and Memory. Lincoln: University of Nebraska Press, 2012. Pennsylvania Academy of the Fine Arts. Symbols of Peace: William Penn’s Treaty with the Indians: An Exhibition Sponsored by the Pennsylvania Academy of the Fine Arts and Dickinson College: The Pennsylvania Academy of the Fine Arts, Philadelphia, Pennsylvania, May 12-September 26. Philadelphia: Pennsylvania Academy of Fine Arts, 1976. Speck, Frank G. The Penn Wampum Belts. Leaflets of the Museum of the American Indian, Heye Foundation. New York: De Vinne press], 1925. Stone, Frederick D. “Penn’s Treaty with the Indians: Did It Take Place in 1682 or 1683?” Pennsylvania Magazine of History and Biography 6, no. 2 (1882): 217–238. Vaux, Roberts. “A Memoir on the Locality of the Great Treaty Between William Penn, and the Indian Natives in 1682.” In Memoirs of the Historical Society of Pennsylvania, edited by Edward Armstrong, 1:87–106. Philadelphia: J.B. Lippincott & Co., 1864. Voltaire. Letters Concerning the English Nation. London: Reprinted by and for George Faulkner, 1733. Pennsylvania Academy of Fine Arts, 118-128 N. Broad Street, Philadelphia. Historical Society of Pennsylvania Collection, Philadephia History Museum, 15 S. Seventh Street, Philadelphia. Andrew Newman has done a wonderful job of presenting what may be , ” the oldest story in town”. Penn lived at Fairmen’s Mansion where the Shackamaxon Treaty Tree stood in all its splendor. The Great Elm was at the site for another 128 years. The memory of the Treaty of Friendship has been passed down in the oral history of Native Americans and was unquestioned by the earlest settlers. George Washington had the image of Penn’s Treaty at Mount Vernon. John Marshall expressed in a letter to Roberts Vaux the special significance of this event. However, the significance of the story may be that it has been passed down from generation to generation. First in the heart and mind, later in art, poetry, objects from the fallen Elm and later the first public monument and finally a permanent Park. It is a story that represents the best of the Human spirit. We are tracing our family tree and we need a copy of the original peace treaty signed by the Lenape Indians for the Delware Water Gap. This could possibly be a different name. Any help in any general direction would be appreciated.